Antiseptic Solution by F10 Products can be used as a nebulizing therapy for upper and lower respiratory tract infections, for flushing for nasal and sinus infections, and for wound irrigation and lavage. Benzalkonium Chloride - 0.022g/100ml, Polyhexanide - 0.0016g/100ml, Non toxic ampholytic surfactants, sequesterants and water - to balance. Using clean or distilled water prepare a solution of 1:250 of F10 Antiseptic Solution. Administer topically using a nebuliser or fogger for 20 to 30 minutes twice daily or as directed by the veterinarian. Using normal saline prepare a solution of 1:250 of F10 Antiseptic Solution. Restrain the animal with its head downwards to avoid aspiration and syringe the cavity as necessary. Below are some recent questions we've received regarding F10 Products Antiseptic Solution, including answers from our team. Can you use this F10 Antiseptic solution to treat guinea pig eye infection? This is not recommended for use on eyes. It is likely that the spot on is working but it is very important to treat the house/environment. Most of the fleas will live and breed in the environment and jump on the rabbit as he passes. Once on the rabbit the fleas will likely be killed by the spot on but not straight away hence why you are still seeing fleas. I would use Virbac Indorex spray to treat your rabbits environment but keep him out of the way for 1-2 hours after spraying to ensure all the spray has settled on the surfaces. 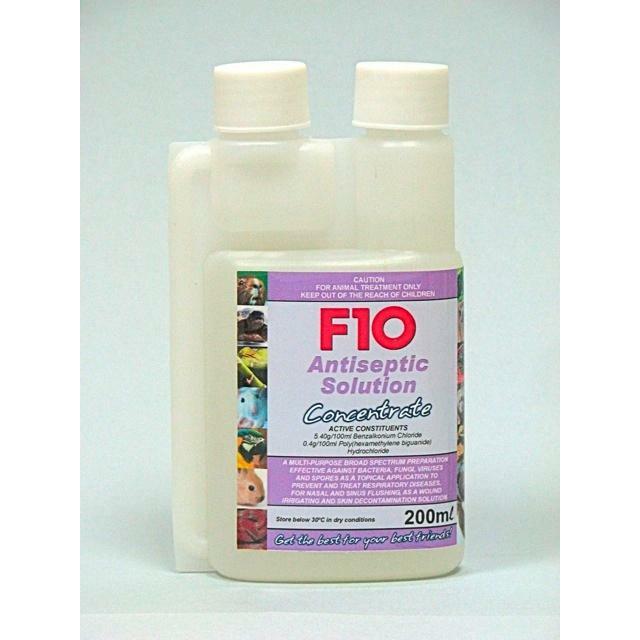 F10 antiseptic solution is used to treat infections rather than fleas so would not be useful here.